Leonardo De Chirico is an Italian citizen and a resident of Rome, Italy. Currently Leonardo serves as the pastor of Breccia di Roma, a Reformed Baptist church, while also serving in a number of other roles in Italy. 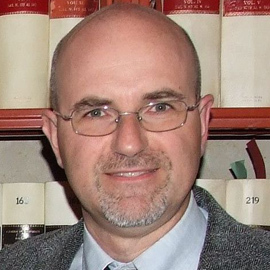 He is Adjunct Director of Istituto di Formazione Evangelica e Documentazione (an Italian evangelical research center), editor of its theological journal Studi Diteologia, and director of the Center for Ethics and Bioethics (CSEB). He is also vice-chairman of the Italian Evangelical Alliance. Together with Pietro Bolognesi and Andrea Ferrari he has been general editor of the Dizionario di Teologia Evangelica (2007). He is married to Valeria and they have two children, Filippo and Akille. Dr. De Chirico teaches The History of the Christian Church.